I purchased this device after suffering for 3-4 months with knee osteo-arthritis and a quad tear - with an MRI that said I was okay. I could not walk, seriously. Had 3 drains by the doctor in knee and quad and multiple cortisone injections. I had a big trip coming up to Utah and could not get off the couch, could not walk. My wife told me to cancel. My R.N. 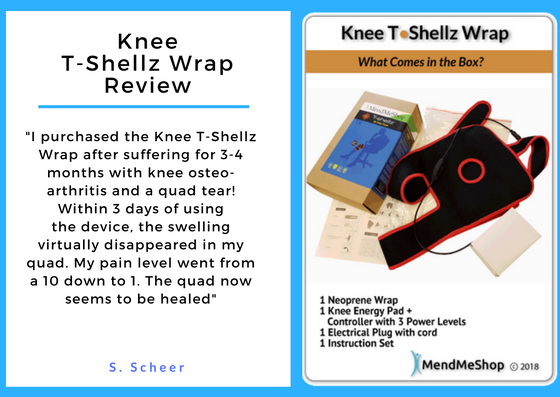 wife and her friend found this device (Knee T -Shellz Wrap) online and I was not hopeful as nothing was helping. Within 3 days of using the blood flow device, the swelling virtually disappeared in my quad. My pain level went from a 10 down to 1. The medial site on the knee which if touched was horrible - was now fine! The quad now seems to be healed, no swelling at all, In 7-8 days. I still have some knee issues but the pain is gone. Went on the hiking trip, had to be careful and not overdue it but I could not get off the couch!In favoring and jumping around for months my hip is out and going to treat with this machine also. I would not have believed it possible but it is. 3 docs and one telling me I needed a knee replacement. I am amazed.